I was a robot once. More accurately, I spent a day as a telepresence attendee at a conference, including “rolling” the expo floor. It all started when I was helping Association Forum identify innovative technology displays for the Digital Depot at Holiday Showcase. I remembered a Modern Family episode about Phil not making it home for his daughter’s graduation party—instead, he attended via a telepresence robot. I couldn’t resist the opportunity to try it myself! My experiment wasn’t just for kicks. The events industry should start thinking about telepresence attendees as this technology becomes more popular and accessible. It’s a viable option for people who would rather attend an event remotely instead of spending time and money flying to a conference or tradeshow. The telepresence experience is nothing like attending a virtual conference. It is definitely not a passive experience. You don’t just sit there and watch streamed sessions. You get to move around the expo floor, roll your way into sessions, and talk with exhibitors and fellow attendees. While Phil on Modern Family used a Double to attend his daughter’s party, I used a Beam to attend Holiday Showcase—either device looks like an iPad on a stand with wheels. Meanwhile, I was back in the office using the Beam app on my laptop to control my alter ego. If you want to attend an event from afar, all you need at your real location is a computer with the Beam app (that’s linked to your Beam device), webcam, and microphone. The app is simple, taking only about 5 minutes to learn. You control the Beam’s direction using a mouse or the arrows on your keyboard. On your screen, a fisheye camera gives you about 180 degrees of navigational view, plus a straight-ahead view. On the other end—at the conference—you need someone to get the Beam rolling for you. We shipped the Beam to the event site in Chicago. DelCor's Chicago-based strategic consultant, Jim Gibson, was onsite to unpack the box, plug in the charging stand, place the Beam on the stand, and connect it to Wi-Fi. When the Beam was charged up, I used it to leave the Digital Depot and wander around the show floor. Here’s what I learned along the way. Lesson #1: Have an expo floor map handy and know your booth number. I started out on my big adventure, rolling up and down the aisles, but soon realized I didn’t know where I was and didn’t know how to get back to the Digital Depot. I didn’t even know the booth number. You have a different sense of space in 2D. It took me a while to adapt to this new perspective and get a feel for where I was in relation to landmarks, like our booth or the outside hall. Lesson #2: Avoid noisy environments. I had the volume turned all the way up, but people still couldn’t hear me, though I could hear them just fine. Once, I had to yell for help because the Santa hat I (the Beam) was wearing slipped down over the screen and I couldn’t see. It took a while before someone heard my muffled cries for help. Lesson #3: You need a steady Wi-Fi signal (and maybe a geo-tracking tile, too). The Wi-Fi signal was weak in one section of the hall. I could hear and be heard, but couldn’t see or move. Once again, I yelled for help and texted Jim so he could find and move me. Before he arrived, a lady came to my rescue and pushed me along until I got the signal back. My rescuer was very kind: “Are you okay? Do you need anything else?” She was amazed I was sitting in Silver Spring (Maryland) while also wandering around the show in Chicago. Lesson #4: You have limited physical capabilities. The Beam doesn’t have hands. It can’t open doors or pick things up. From your far-away controls, you may be limited in where you can roam. I rolled up to an escalator, then decided not to chance it. Elevators would be a problem too without a strong Wi-Fi signal, although it could be entertaining to ride up and down—unable to push any buttons—and chat with fellow passengers. People saw me coming, and they saw my face rolling toward them on the screen, just as they would if I were on Facetime. In quiet areas of the expo, people could hear me coming too because the Beam sounds like a small scooter, but I took some people by surprise in noisier spots. Most people had a cautious attitude: “Oh my, what is that?” They looked but didn’t get close, acting as if I might have a built-in taser. I’d say about 20% of people avoided me, pretending they couldn’t hear or see me. And then there’s the alcohol factor. Many exhibitors at this event serve drinks. By the end of the first hour, when the buzz was starting to set in, Loretta DeLuca (our CEO) and Jim could tell where I was from the cheers and yelps of “There he is!” Then the selfies started. Talk about an icebreaker. 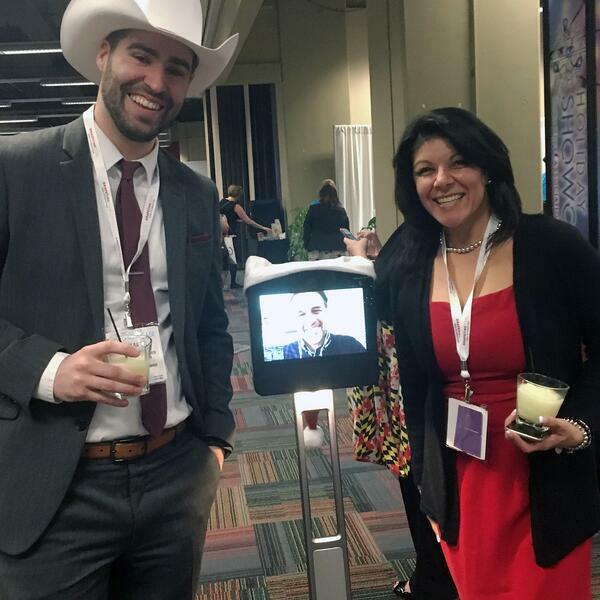 Networking is no problem when you’re a telepresence attendee, especially if you don’t mind attracting attention. In that regard, telepresence attendees have an advantage over regular attendees. 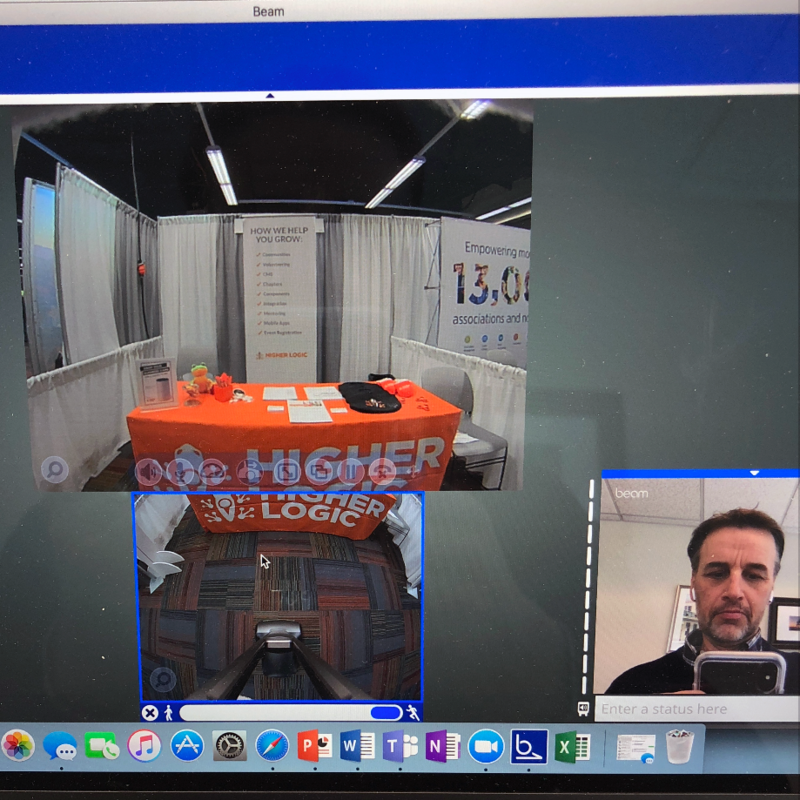 I had many meaningful conversations with exhibitors, so that aspect of telepresence works fine. As you’re rolling around, you can see friends and acquaintances coming toward you just like in real life, and they can see your face coming toward them. Telepresence attendees can interact with other attendees, unlike virtual attendees who are tied to their computer screen and must passively view whatever's in front of them. Telepresence attendees can move around—it feels like you’re really there. As a telepresence attendee, I didn’t have to schedule time for travel and didn’t have to pay for airfare, hotel, and other travel costs. If prospective international attendees have trouble obtaining visas, telepresence is a great Plan B. You do have to think about logistics if the event’s organizer doesn’t provide telepresence equipment. It isn’t free—there may be costs associated with shipping the device and ensuring you have power. The battery life on my model was only a couple hours—other models provide more power—so Jim helped me recharge (although I could easily do it myself by getting the Beam within line of sight of the base and instructing the Beam to auto-park itself for charging). Should you provide a telepresence option for your attendees? 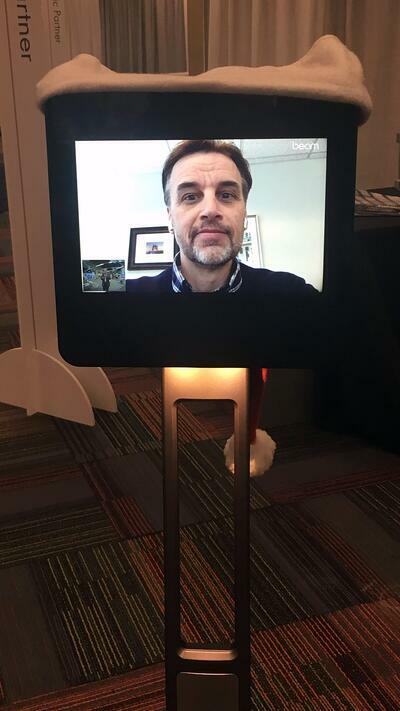 It may make sense for your association or nonprofit to have telepresence robots available for remote attendees and speakers. When pricing remote registration, take into consideration the amount of money the participant saves by attending via a telepresence. The cost per robot (roughly $1,200-$1,500 each) comes down as you reuse them. You don’t have to dedicate one device to each telepresence attendee. For example, multiple attendees, each with their own unique login, can use each Beam device. The app allows scheduling and reservations to ensure the Beam is available when the attendee needs it. Have staff on hand to set up the devices, recharge them, and assist telepresence attendees when necessary. Provide orientation for telepresence attendees. Introduce them to their aides (Beamsitters) and to each other, if feasible. Give them tips for getting around the venue, including the best routes for robotic travel and charging station locations. Consider adding special signage placed at the optimal sightlines for telepresence devices. Ask telepresence attendees to provide a plan for their activities, so you know which sessions they plan to attend. Remember, they can’t open doors on their own. In addition to staff aides to help them along, you might implement a buddy program. The second outing for our Beam was at the SmartTech Conference. Our CIO, David DeLorenzo, used it to co-present a session. 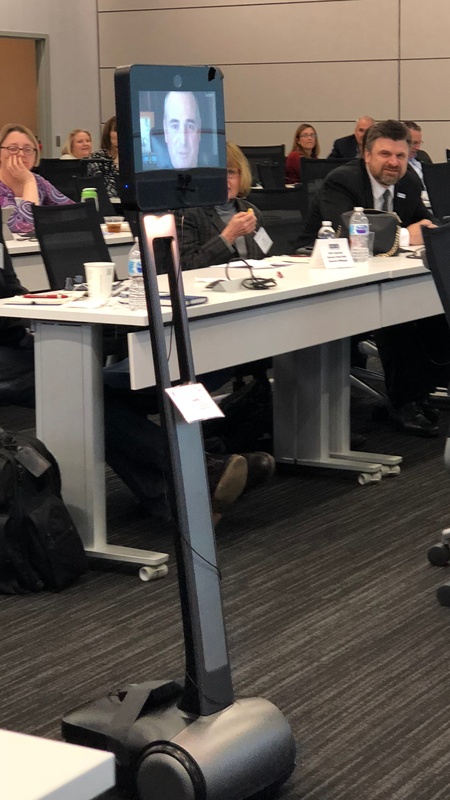 Unlike a speaker Skyping into a session, a telepresence speaker can roam around the room to join in on group discussions, and continue the conversation in the hallway or while rolling to the next session. We use the Beam for remote working too and can see this application working well in the association and nonprofit world. A remote employee could “wake up” the telepresence and use it to visit the office: catch up with colleagues, meet with their supervisor/team, and attend meetings. I’m hoping the Beam and I will attend a few association industry events in the coming year. Keep an eye out for us so you can get a sense for how your association might use telepresence devices at your events or in your office. Dave wears many hats—president and professor among them. Author of DelCor's IT Maturity Model, he speaks, blogs, and even teaches on a range of strategic technology topics.